Moving out of your rented home? Overwhelmed by dealing with removal companies, packing and actually finding a new place? Let Monster Cleaning relieve you from even just a small portion of the hassle, stress and strain that your upcoming moving day poses on you by handling the end of tenancy cleaning job. As the best professional sanitation firm in Battersea today we have the means to complete the project properly, on time and without any complications. And we have a hundred percent success rate when it comes to securing the refund of our clients’ rental deposits. What more can one want? We do end of tenancy cleaning in Battersea in a manner that is truly up to all industry standards. Our staff consists of very well trained, licensed and very responsible technicians who know the ins and outs of the business and would be able to handle the job that you have for them swiftly and with style. Over the years they have had the chance to work for countless tenants and landlords from around the area, all of whom have been deeply satisfied by the results that have been achieved on their individual projects. Not only that, but prices for end of tenancy cleaning in Battersea with Monster Cleaning start at merely £89. Sounds like a deal, right? We take great pride in the fact that the rates we operate on make our services affordable to a wide range of clients. In addition, we have quite a few permanent deals and special discount offers that you can make use of. Landlords inevitably get 10% off when they book a Battersea area end of tenancy cleaning with us. All EOT sanitation jobs also come with the opportunity to book carpet cleaning at a 50% discount. Explore the options we present you with further without any delay. 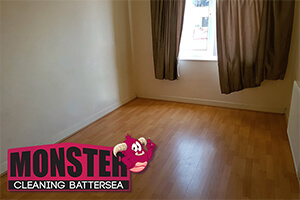 Book Monster Cleaning Battersea now for the day and time you’d like to receive our specialists. Our trained, capable and very energetic staff is looking forward to being at your service, day in and day out. We will do whatever is in our power to live up to your expectations and needs.